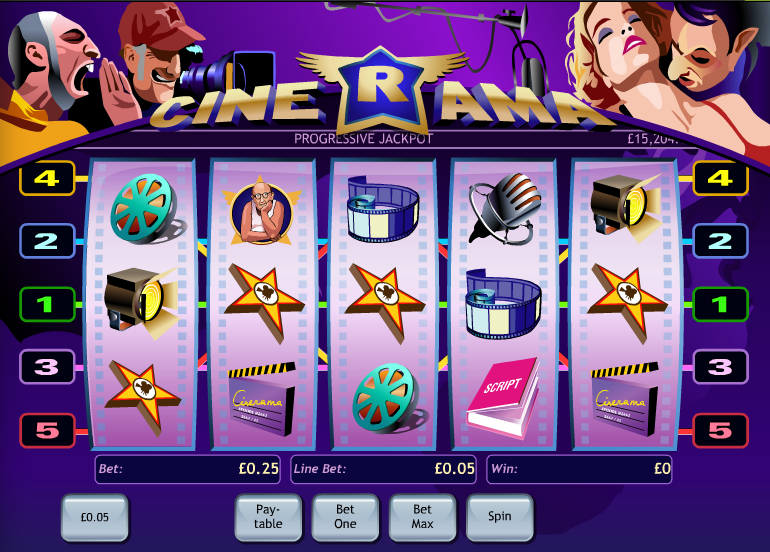 The world of film and television is the theme of Cinerama, historically one of Playtech’s more popular slots. It adds to a busy genre of online slots which includes more than a few movie and TV-related games but this is the only one based on the industry itself. It’s the progressive jackpot which keeps regular players coming back for more. Cinerama is a five reels and five payline slot which admittedly looks a bit dated now but that somehow fits in with the overall feel of the game. Even if all the colours are black and white if wouldn’t detract from the atmospheric background which includes a director with his camera and the classic movie pose of a woman being bitten by a vampire. Movie items make up the symbols and so we have a microphone, a reel film, a clapper board, a script, a megaphone, a spotlight and a star. If you want to activate the bonus rounds you’ll need to land either a headphone or a director symbol; the movie camera is the wild. You need to land the headphone scatter symbol anywhere on the first reel and you’ll then be taken to a cinema; pick the film you’d like to watch and you’ll be awarded a prize based on your choice. This is a slightly more interactive game and you need to land three of the director symbols on an active payline; you will now get that chance you’ve always wanted – be a director and pick your male and female leads. The scene will now cut to an awards ceremony and you’ll be given a prize based on how successful the movie was. The current progressive jackpot scrolls along the top of the screen and you can win it by landing five of the camera wild/jackpot symbols on an active payline. You must be playing the maximum bet but that’s only £0.25 so hardly a deal breaker. Even if you’re playing with less than the max bet, five jackpot symbols will still win you 10,000 coins. Play with maximum paylines to increase your chances of landing the Headphones bonus and play with the maximum bet to be in with a shot at the progressive win. The jackpot will always be at least £15,000 so playing at £0.25 a spin is a no-brainer. It’s no surprise that Cinerama remains a solid favourite among players, despite it’s age; two bonus rounds and a progressive jackpot make it a must-play for slots fans. The oddly atmospheric graphics add to the appeal.